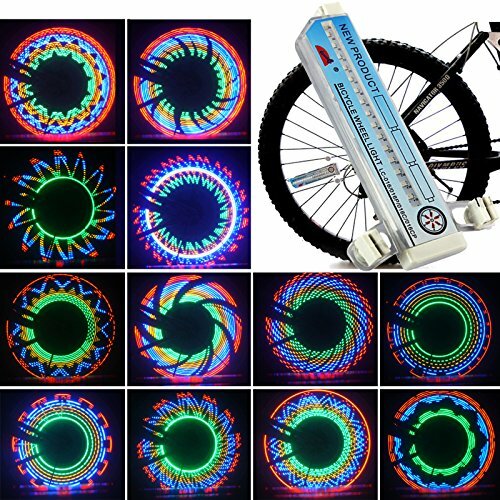 Colorful Bicycle Lights 32 LED spinning wheels Light Lamp 32 Pattern Bike Accessories Valve Flashing Spoke Light Cycling Bikes Bicycles Outdoor, Light your life! 【LIGHT SENSOR & DYNAMIC SENSOR, AUTO ON AND OFF, ENERGY SAVING】 Without button for power on/off, only when the bike moves at night or in dark area, the led bike spoke lights will light intelligently. 【32 GORGEOUS PATTERNS CHANGE DESIGN, SUPER BRIGHT】 led bike wheel lights is made of 32 pieces double-sided led lamp beads, 32 patterns, patterns change every few seconds. Better working speed was 20km/h. Different speed, these bicycle wheel lights will have different effect show. 【WATERPROOF DESIGN】The waterproof level of bright bike wheel light is IP55, installing these led bicycle spoke lights, you also don't need to worry about riding in rain day. 【SAFETY AND EASY INSTALLATION】lightweight design, won't affect riding speed, safety for night riding. What's more, don't need any other tool, these bike tire lights can be installed safely. Perfect Birthday Gifts & Christmas Presents for Your Son, Friends, Husband, sport partner ect. 【FITS MOST BIKES】Our bike wheel light can be installed by most of bicycles with 2.00 mm spokes, such as rode bike, mountain bike, fixed gear bike and ordinary bicycles, etc. But pls note, Suitable for ≥20 inch bicycle, not suitable for wide spokes bikes.